Tourists arrive from all over the world to enjoy the beauties of the 3000-year-old city, notable for its exceptional cultural attractions, but also magnificent clean sea, excellent accommodation and great fun. Almost 360 thousand tourists chose Pula as their holiday destination last year; the number is increasing every year, which is 17% more than previous year. They have achieved over 1.8 million overnight stays. And so, once again Pula records a 11% increase compared to previous year. Tourists from all over the world come to Pula to enjoy the beauties of the 3000-year-old city, notable for its exceptional cultural attractions: Arena, Gate of Hercules, Temple of Augustus…, but also magnificent clean sea and excellent accommodation. Tourism Office Pula, together with the City of Pula, Archaeological Museum of Istria, many galleries, numerous associations and tourist workers, strives all year round, especially during the summer months with the greatest number of tourists, to organize a wide variety of events and make their stay as meaningful as possible. Almost every evening there was something going on in the Forum, there was music and dancing at Portarata, and it was just as lively at De Villeov uspon. The citiziens of Pula and their guests enjoyed this summer concerts of Jose Carreras, Robert Plant, Status Quo, Massive Attack, Oliver, Gibonni, Petar Grašo.. In the Pula Arena gladiators fought in front of a large audience that enjoyed every moment of the Spectacvli antiqvi. 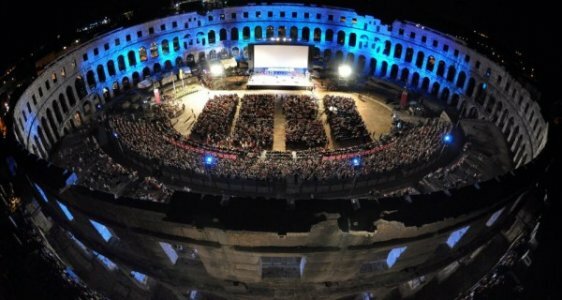 And, not to mention the films of the 63th Pula Film Festival in the Arena, which was packed night after night. It was also interesting to see thousands of young people who came from different parts of Europe for the Outlook and Dimension festivals. The Days of Antiquity, a traditional program, once again this year drew the attention of Pula citizens and its visitors. There were a number of exhibitions this summer. If you are thinking about your holiday, we definitely recommend that you choose Pula, it is always attractive.